It seems crazy to think that the future of Sam Winnall is in doubt despite him scoring 78 league goals throughout his career and proving himself to be one of the Football League’s most prolific strikers. When Sheffield Wednesday stole Winnall from Barnsley for a nominal fee back in January 2017, I was intrigued to see if the inventive striker could make a distinguished career in the Championship with – then at least – promotion chasing side. With strikers in abundance at S6, you can’t deny that Winnall did begin to make an impact, initially from the bench. It soon became apparent that the Owls number 11 was out-of-favour due to circumstances beyond my knowledge. Subsequently, Winnall landed a season-long loan move to Derby County. Although I was still hopeful that the Wednesday forward would be given another opportunity to embark on a potential glittering Owls career, it seems his days at Hillsborough were almost numbered. I feel Jos Luhukay maybe the only lifeline left available to Winnall upon his return to Wednesday. The Owls boss is yet to work with the forward and it could possibly be Jos who determines Winnall’s next venture. 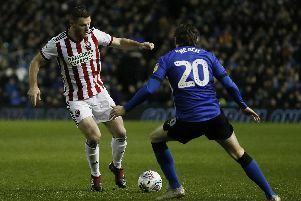 Winnall had scored six goals in 18 appearances under Rams manager Gary Rowett before, unfortunately, it was confirmed in February that he had suffered cruciate ligament damage and would miss the remainder of the season, leaving his future in further doubt. Matej Vydra is on fire this term for the Rams, and, with the addition of experienced forward Cameron Jerome arriving in January, first-team opportunities have become limited. Unless Derby can get Winnall at a bargain price, Gary Rowett may turn his attentions elsewhere. It is my guess that Derby County may offer somewhere in the region of £2 million for Winnall’s services, if they do so at all. I’m hoping that if an agreement is made between two clubs, that the Owls could receive a sum around the £4-5 million to see Winnall depart, yet, I imagine this will be unlikely unless another club come calling. I would love to see Winnall given one more opportunity under Luhukay at S6, but, with a heavy heart I can only assume that he’ll be shown the exit door in the summer months. Like the rest of you, I’m left wondering what could have been.